Having this for takeaway means that I did not get to have the soup on the side. I took this photo about 15 minutes after receiving the food, but it did not seem to affect the quality by much. What the hell is Wanton/Wonton Mee? This particular stall is found along Macpherson Road. The above is a Singaporean version of Wanton Noodles, which is a noodle dish served with Wanton. The Singaporean version adds Char Siew, leafy green vegetables, with the option to have it dry (soup on the side) or souped. An oyster sauce or soy sauce based sauce is usually then used to dress the noodles on the bottom of the bowl, which the eater then toss and flavour the bowl of noodles right before digging in. 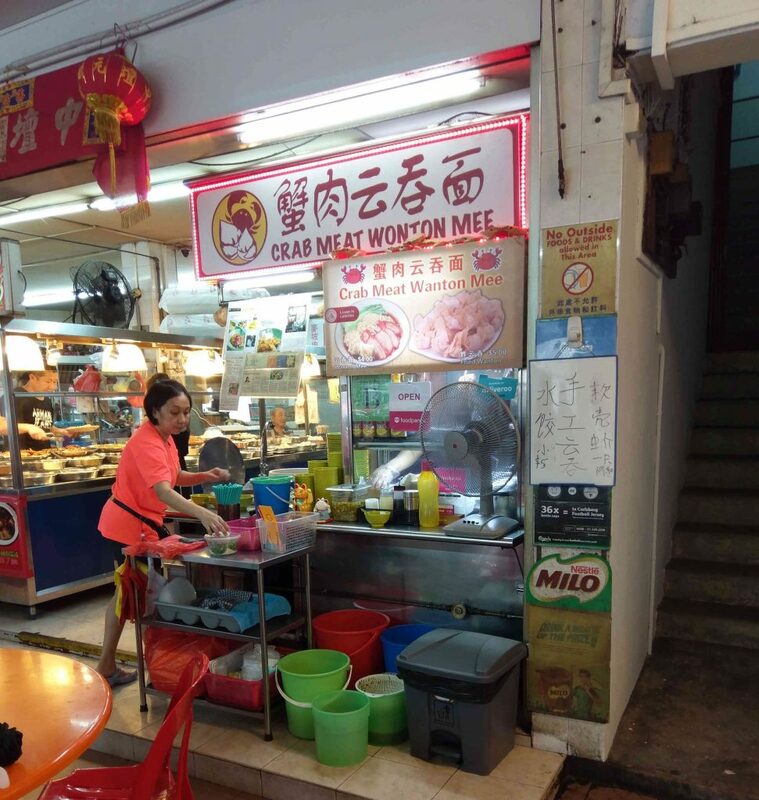 This particular stall apparently uses a combination of crab meat and pork (the common meat for Wanton) in their Wanton, as well as having a small sprinkle of crab meat as garnish (which you can see as the white sprinkles on top of my leafy vegetables). 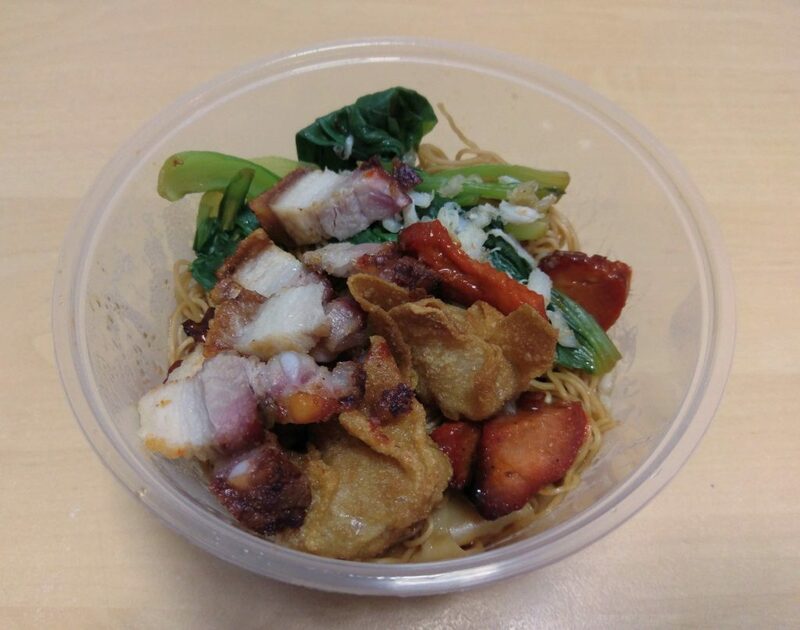 To most Singaporeans, the unique selling point of this Wanton Mee would be the crab meat. 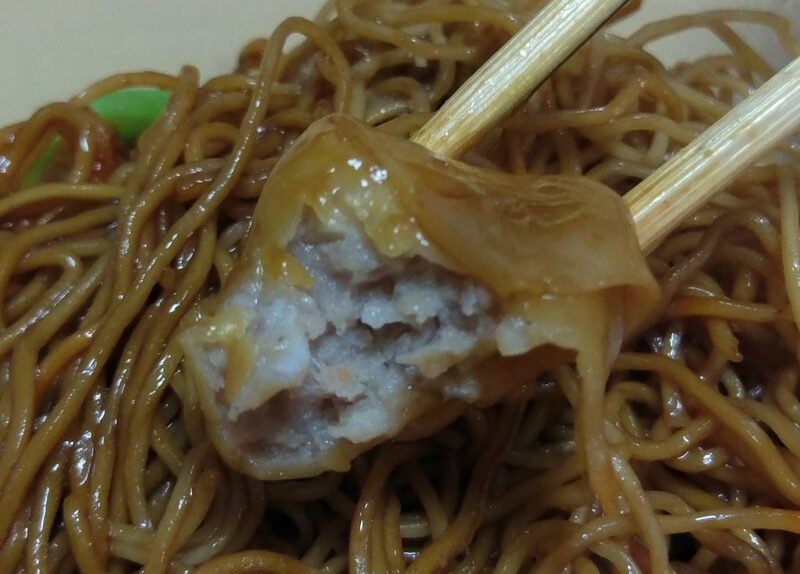 A visual inspection does not show if the meat is a good combination of crab and pork, but an obvious cube of water chestnut can be seen. Skin of the Wanton is perfectly crisp, and the water chestnut gave it a good watery crunch alongside the meatball texture you experience when biting. 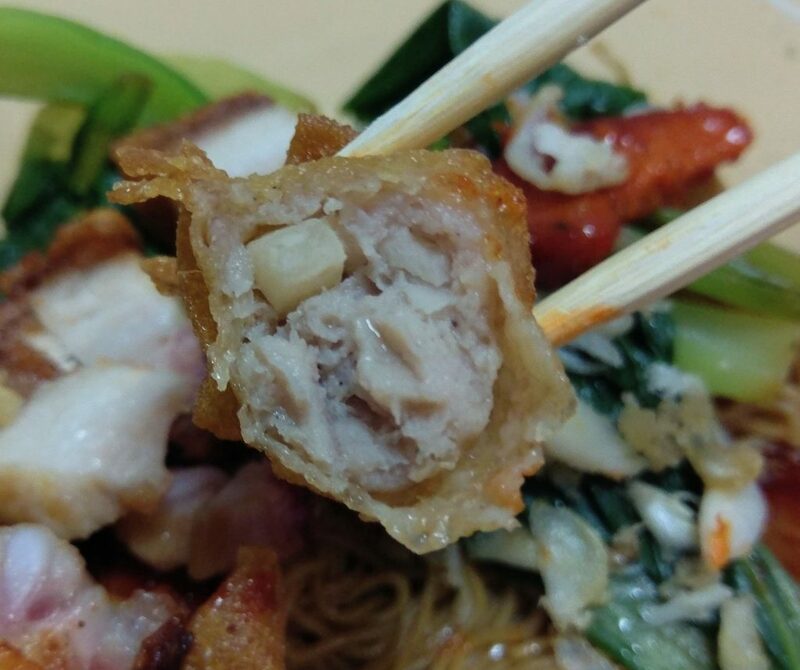 While the Wanton is delicious, the flavours of the Wanton is predominantly pork, and crab could hardly be tasted. Besides the fried Wanton, there is also the boiled version included in the bowl. The boiled version had a similar filling, but in terms of flavour seemed a bit different, and a bit off in a way that I couldn’t put my finger as to why. 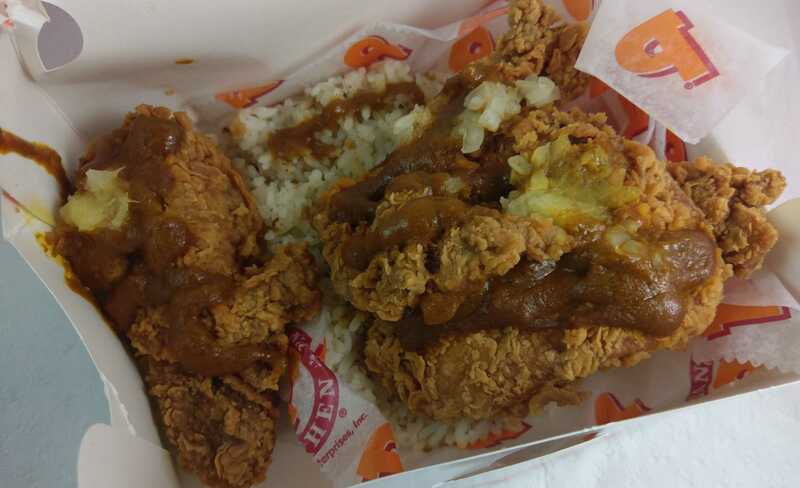 Definitely preferred the fried version. While I asked for chilli, the black sauce wasn’t spicy at all, so I am led to believe that it is a small mistake on my order. 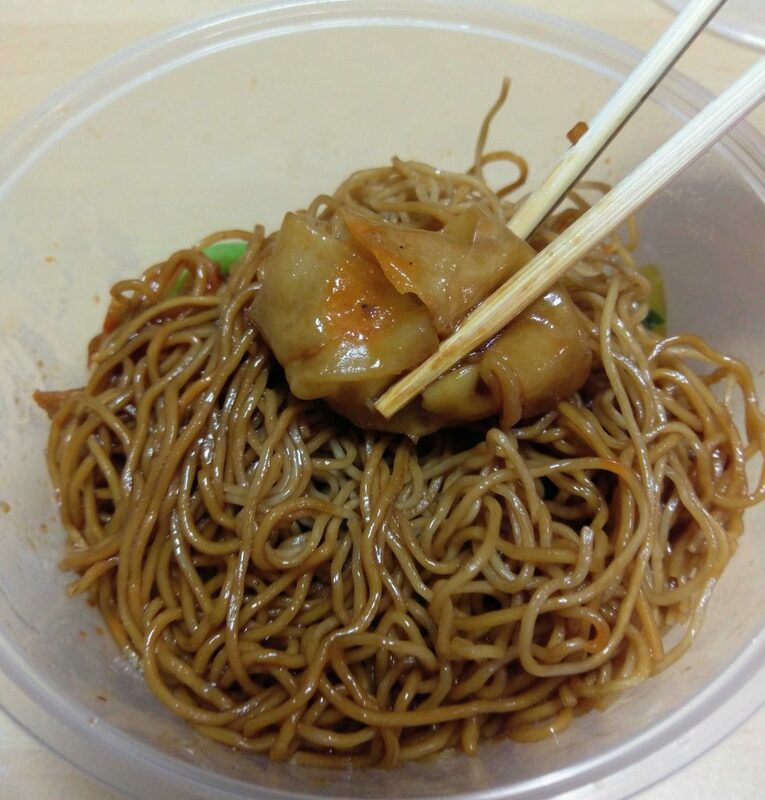 Nevertheless, the Malaysian style black sauce is sweet and savoury and accompanied the noodles and other ingredients well, not being overly strong in its flavours while adding a good even coating. Noodles had a light chew with a very thin thickness. The crispy pork belly is a bit on the saltier side, but the crispy skin is very satisfying and had a light char taste, with fatty salty meat under. 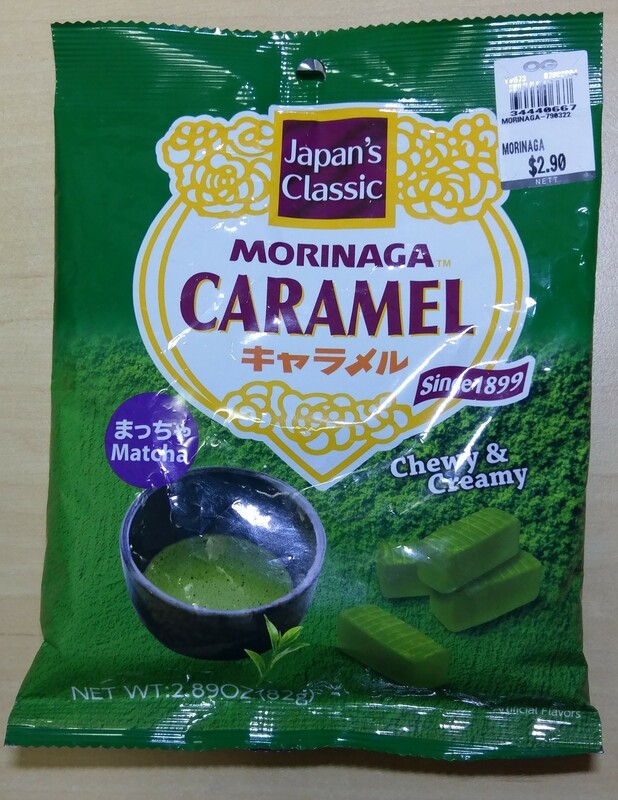 For a S$1 addition, it is worth it. The Char Siew, unlike their pork belly, was lacking the char taste. Pretty average. Crab meat sprinkles and leafy green vegetables are hardly worth mentioning, as they did not add much to the dish. A light walk will do. While crab meat is a unique selling point, I do not feel that it added much to a typical bowl of Wonton Mee. There is little reason to visit the place if you are currently faraway, unless you are absolutely adamant about trying it. Of course, it is still a bowl of good quality noodles at S$4/5. Even despite the gimmicky selling point, I am more than satisfied with paying S$4 and then subsequently being a little bit disappointed about the crab meat. 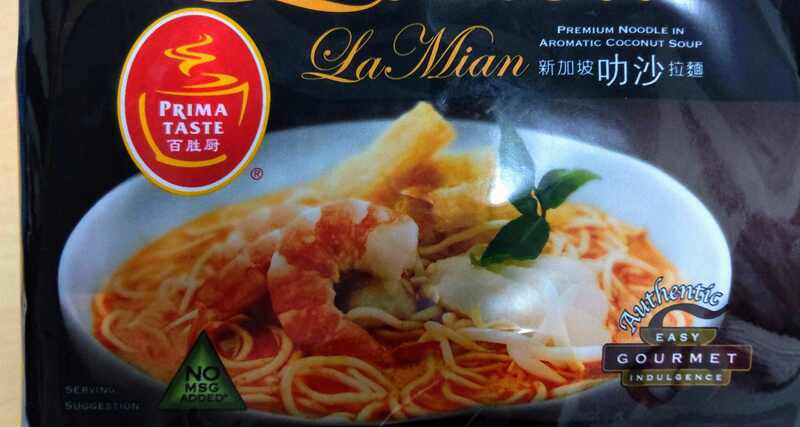 If they wanted to make crab meat Wonton Mee a thing, perhaps they should add a premium menu item that really brings the crab flavours, by for example, utilising more crab meat as the central ingredient. ieatishootipost gave it a solid 4.25/5, claiming that the crabmeat wontons are some of the best around. Although, this is a review of when the stall had a different management team. MissTamChiak thought that the execution of the dish failed to deliver and required tweakings. AllAboutCeil thought that there is still much room for improvement. NickEatFood Good plate of noodles and plump Wontons, crab meat portion is pathetic and doesn’t make a difference. An article by The Straits Times put the crab meat Wonton as one of the 15 best Wonton Mee in Singapore, with great Wontons but lacking in the sauce department. Burpple reviews in general seem to mirror mine – delicious, but fails on its selling point for the crab meat. Facebook reviews are at 4.6/5. Although they only talked about the Wontons being delicious, the written reviews are given in 2016 only. Google Reviews had it at an average of 3.5/5. Bad reviews seem to be given on the basis of being disappointed.